Description: This is a masterpiece by Mastersmith Bill Burke. 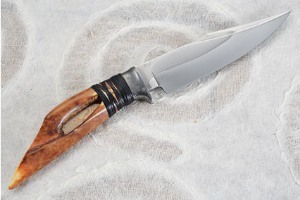 Whether making chef's knives, hunting knives, or art knives, Bill is well known for creating some of the highest performing knives found anywhere. 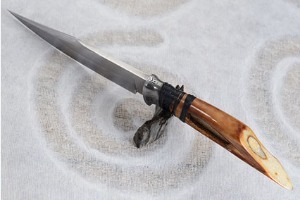 The blade was forged tightly to shape from 52100 carbon steel. Many knife users and knife makers feel that 52100 is among the best - if not the best - steel currently used to make knives. The blade has a raised clip (often called a harpoon tip) and a clear differential heat treatment line. The heat treatment is a highly detailed process that was developed between Mastersmiths Ed Fowler and Bill Burke after years of trial and experimentation. This technique, involving low temperature forging, triple quenching and triple tempering creates some of the sharpest and most long lasting edges found anywhere. A differential heat treatment results in a blade with a soft, supportive spine and a keen, long lasting edge. Bill's mark, BTB is engraved on the left side of the blade, with his M.S. mark engraved on the right. 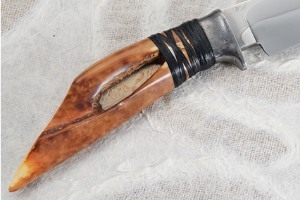 The handle is formed from an ancient walrus ivory harpoon tip. Inuit used ancient walrus ivory for many daily uses, due to its incredible natural strength and durability. Harpoon tips of this size were particularly rare. 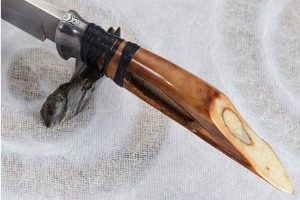 A central hole in the middle of the handle was used to attach the harpoon tip to a shaft. 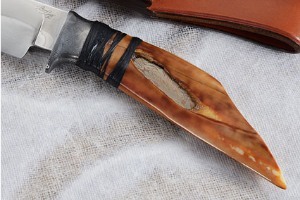 Black sinew is used at the front of the handle. The bolster is nearly as amazing as the handle. The bolster is formed from Bill's M.C. Escher damascus. It is among the most difficult patterns that he ever made and a pattern that was only put on a very small number of knives. Like M.C. Escher's famous artwork, the damascus creates the impression of three dimensional boxes where the perspective changes as they are examined. 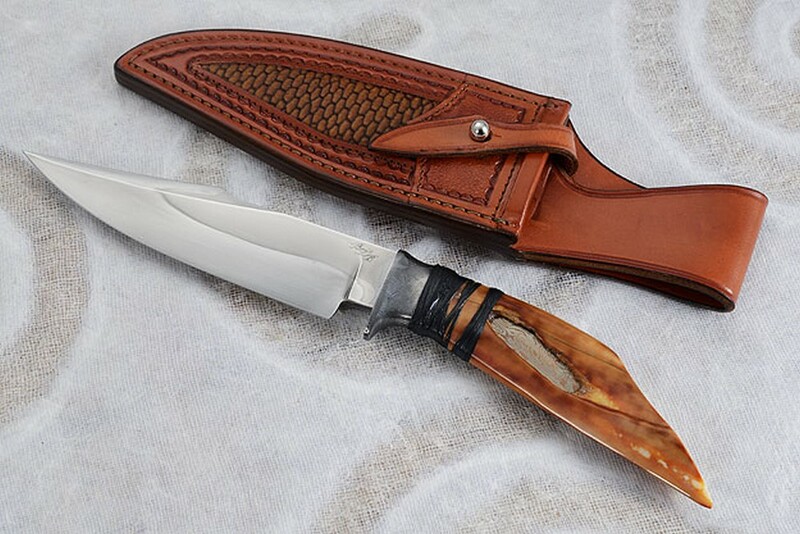 The knife is accompanied by a custom hand stitched leather sheath by …. The center is meticulously inlaid with beaver tail leather.